Cream is high in milkfat and is present naturally in whole milk. 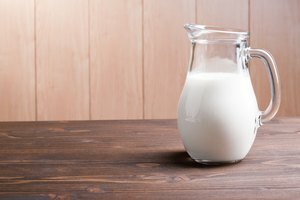 When milk is not homogenized and left to stand, it separates into cream and fat-free milk as the milkfat-rich cream floats to the top. Cream can be churned and the fat from the cream solidifies into butter, leaving behind a low-fat liquid that is slightly acidic. This is traditional buttermilk. 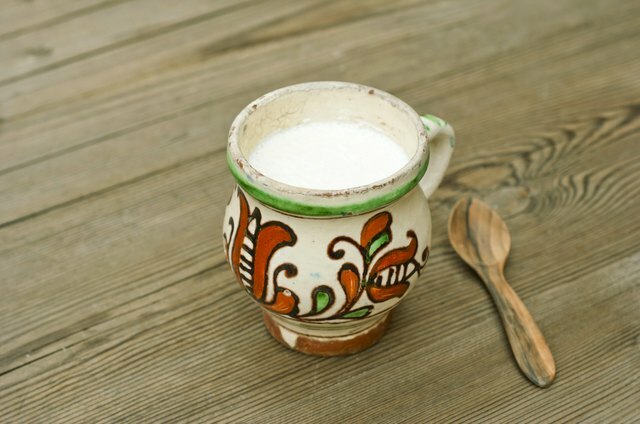 Both traditional buttermilk and cultured buttermilk — low-fat milk with added cultures — are high in acid and low in fat. Buttermilk is used as a leavening agent for quick breads — breads that are made without yeast. The high acidity of buttermilk, whether traditional or cultured, reacts with baking soda to create carbon dioxide. This gas appears as bubbles in food, giving them light, fluffy texture. Because cream does not contain significant amounts of acid, it cannot work as a leavening agent. Both cream and buttermilk keep baked goods moist and tender. The added fat and liquid gives baked goods richness. Buttermilk gives a tangy flavor to foods that cream does not, but the higher fat content of cream means richer-tasting foods. 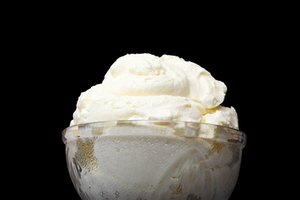 Different types of cream contain varying amounts of fat, from 48 percent butterfat to only 10 percent butterfat. If there is no buttermilk available, you can substitute with soured cream, giving cream the same leavening ability as buttermilk. However, unless you make your own buttermilk from cream, it will not have the same tangy flavor. 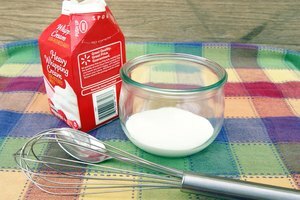 To make buttermilk from cream, combine 1 tablespoon of buttermilk with 1 cup of cream and let it sit, covered with a napkin, for up to 24 hours. Refrigerate it for six hours and stir it before using. You can make a buttermilk substitute with cream by adding vinegar or lemon to cream — 1 tablespoon of acid per cup of cream — and letting it sit for five to 10 minutes. 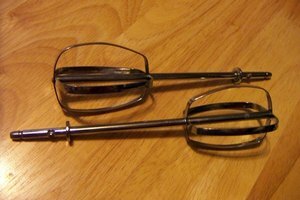 If you do not wish to sour the cream, replacing the baking soda in your recipe with baking powder results in a similar leavening reaction. Baking powder is baking soda with a powdered acid and starch added. When placed in the presence of liquid, the acid and base in baking powder react, forming gas bubbles that lighten baked goods. Baking powder is double acting as it also functions as a leavening agent when heated, helping foods rise further. Replace baking soda with four times the amount of baking powder for a similar leavening reaction. Like with buttermilk and baking soda, this leavening is temporary, so cook the batter or dough soon after mixing.